Besides the magnificent English manor Ashby, located in Northamptonshire, there is another castle in England named Ashby. 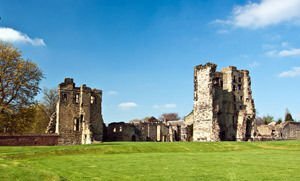 The medieval castle ruins of Ashby Castle are located near the small market town of Ashby-de-la-Zouch, located in the county of Leicestershire. The official name of the castle is Ashby-de-la-Zouch, but the castle and the small English town are better known as Ashby. The ruins of Castle Ashby are declared as a cultural monument of the first degree of the English Department, which manages the historical and cultural heritage. The intriguing scenery of Castle Ashby is renowned as a natural backdrop of the classic novel by Sir Walter Scott - Ivanhoe, written in 1819. The history of the early medieval fortress Ashby started somewhere in the 12th century, when it represented a family mansion. Its owner was Alain de Parrhoet, and it was he whom decided to raise the Norman fortification. In the years of 1474 and 1483 the then owner of Ashby - Edward IV's Chamberlain Lord, added the chapel and the observation tower. Later Ashby Castle was visited by several senior ranking officials, including Henry VII, Mary - Queen of Scots, James I and Charles I. Today, Ashby Castle is a popular place among tourists in the area. Visitors there have the opportunity to learn about the dramatic siege of Ashby thanks to the audio tour which is totally free of charge. The tour of the medieval ruins of Ashby will let you feel the original setting for many scenes in the classic story of Ivanhoe. Be sure to explore the mysterious passage, which leaves from the kitchen and was used actively during the siege of Ashby. Everything is as close to the real events of that time – do not forget to take your torch to light the the way through the tunnel. Within the large and interesting Ashby Castle you are able to get a guide book and buy some souvenirs from the gift shop. You can also explore the medieval ruins and have a pleasant picnic in the park areas around Ashby.